An unbeaten 35-run ninth wicket partnership between Rustam Bhatti and Durand Soraine helped Canada pull off a narrow two-wicket victory over Namibia in Windhoek. In a game of seesawing fortunes, the Canadian pair held their nerve and helped their team take a 1-0 lead in the two match series. Chasing a moderate 184, Canada started aggressively as Hiral Patel scored five quick boundaries, but his downfall opened the doors for Namibian bowlers as they picked up three more wickets for the addition of only 18 runs. A crucial half-century partnership between Jimmy Hansra and Usman Limbada steadied Canada's innings as they crossed the 100-run mark. But with Limbada's fall, the wheel of fortune turned Namibia's way and they kept taking regular wickets to reduce Canada to 149 for 8. 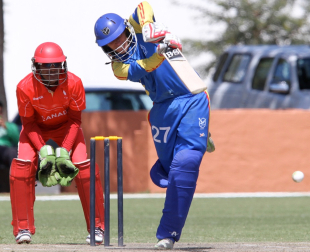 The advantage at this stage was clearly with Namibia, but their effort to purchase a wicket ended in frustration as the ninth-wicket pair took Canada past Namibia's total. Namibia themselves had been helped by a resolute innings by Raymond van Schoor, who scored 90, after their top order had succumbed to Soraine and Henry Osinde's medium pace. Namibia had lost their top four with only 16 runs on board, but a string of partnerships helped them to put up a competitive total.